10 virtual musical instrument projects presented by Cheryl Burgemeister. Suitable for teachers looking to develop their technology and coding knowledge in the music classroom. For use with students from middle primary to early secondary. Coding has become a skill which all students need to learn in the primary school years. It provides opportunities for cross-curricular learning in mathematics, science and the arts. 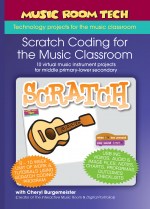 Here’s an simple way to introduce it – Scratch Coding for the Music Room makes it easy with step by step tutorials, videos, audio and image files, notes, charts, proformas and outcomes checklists. 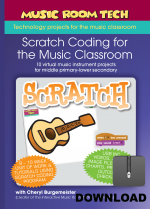 Use this 8 – 10 week unit of work to teach your students to code their own virtual musical instruments using Scratch, an online/offline, computer based, coding program used to teach the basics of coding. This product is available to purchase on USB drive, or as an immediate download at a reduced price! Also available is Scratch Coding for the Music Room: Makey Makey edition. Click here for a comparison of the two products to work out which is best for you. Contents: video demonstration & screencasts (links), audio & image files, notes, charts, proformas, outcomes checklists. Scratch is an online, computer based, coding program used to teach the basics of coding games and apps.